This weekend was really good. Nice. Hot. Busy. Lazy. Very much all of those things. This Saturday was also the yearly Cathedral Village Arts Festival Street Fair, which kind of signifies the unofficial beginning of summer for me. I met up with Becky and we spent a few hours walking around, stopping to watch a busker or a rapper or a rock group or a graffiti artist, peeking in at the booths, eating mini doughnuts. We walked until we were tired of it, and then we sat on the cathedral steps and looked at all of the people. CVAF is prime people-watching time. Regina has that little city vibe, probably because it is, by definition, a little city. I guess that's why people generally don't stray too far from the norm here, but it seems as though there's a portion of Regina's population that hides somewhere all year and only comes out for CVAF and the folk fest in August. Interesting and beautiful and strange people. I like them. I want to know where they go the rest of the time. In other weekend news, the apple tree in our backyard blossomed overnight and the fence surrounding it burst out in bright green vines. I get distracted by it all every time I leave the house. 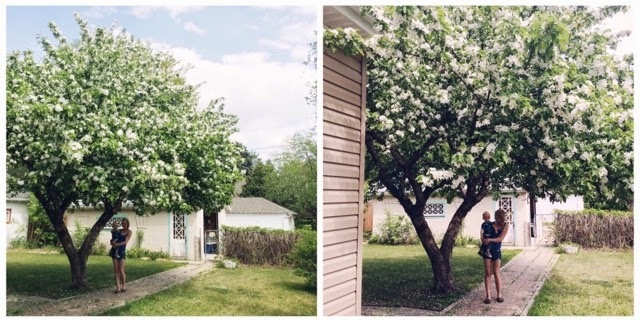 Soon, our whole yard will be covered in little white petals, like summer snow, and the vines will be creeping in on us and out on the neighbourhood and we'll have to gather our wits and courage and shears and chainsaws and battle it back like it's an army. Like I always say, though, "You have to let those vines know who's boss." I always say that. On Sunday afternoon, Barclay took me and Sullivan to a park by our house where he'd found an 18-hole frisbee golf course. I hadn't played frisbee golf in years, and mostly always thought it was pretty boring, but then I played a little and accidentally had some fun. So I guess I'm into that now. 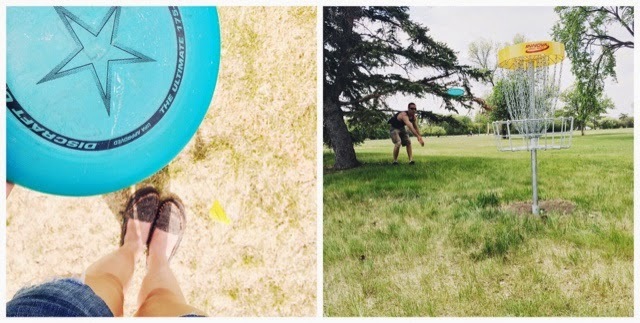 We're going again next weekend with some friends who just had a baby, because frisbee golf is the easiest sport to play with a kid strapped to you or tagging along behind in a wagon and it's free as well. See also: bocce ball and lawn bowling. I guess this is how people get old and uncool: in very innocuous increments, largely influenced by what's cheap and easy to do with kids in tow. Oh well. We may be old and uncool, but at least we're not old and uncool all by ourselves. Sullivan is big into going for walks these days, so we explored a little after we'd finished our frolf game. He found a pinecone on the ground and I think that may have been the highlight of the week for him. We always spend Sunday evenings at Barclay's parents' house. 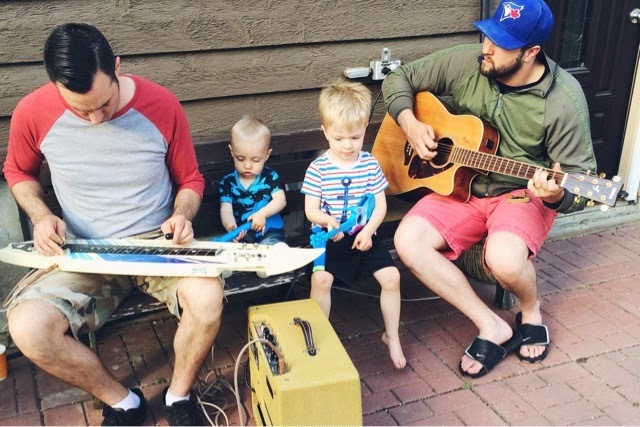 This week, Barclay's dad brought out a lap steel he'd found on vacation, and after supper Scott (bro-in-law) brought his amp out and the guys got to work figuring it out. 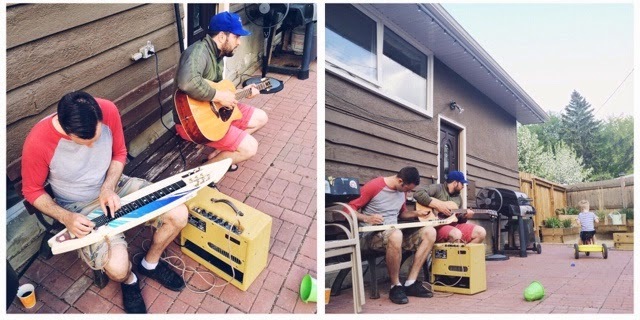 I'm a little bit obsessed with steel guitar (a love which began with this song) and I'm also obsessed with outdoor jam sessions, so my night was made. It was, as they say, the perfect ending to a pretty fantastic weekend.